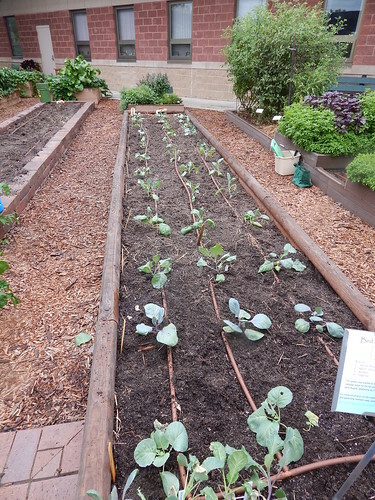 We planted the broccoli, cauliflower, and cabbage into Bed 2 this week, as well as a couple plants of purple cauliflower and broccoli that are in the Kids’ Snack Garden. It may be a bit of a challenge to have a successful harvest from this group, although the long-range forecast looks excellent for a fall garden! The unfortunate thing is that there seem to be lots of insects around, including some of the Imported Cabbageworm moths. Between caterpillars and the “drought” in my office a couple weeks ago, some of the plants were a little sad. Luckily, we found enough good looking ones of almost all the varieties. The only variety that was a problem was the ‘Purple of Sicily’ heirloom cauliflower, which apparently had poor germination that I didn’t notice. We planted the transplants 3 across in the bed, roughly lined up with emitters in the drip line (although we haven’t turned on the water in weeks! ), and spaced more or less evenly across the bed. This gives each plant about 16″ of space, which is a little bit tight, but we are making up for it the other direction, allowing 24″ between varieties. Here’s the entire bed after planting. We did add a little bit of fertilizer to the soil, because these are crops that really like a lot of nitrogen. We should be okay on that, but in this case I would rather be over than under. I’m also assuming that the rain may be leaching some of the nutrients out. We did not water everything, since the soil was moist and the plants had all been out in the rain overnight. We also put a coating of Dipel Dust (Bacillus thuringiensis) on all the seedlings, since we’ve already had caterpillars. I really don’t want to lose the seedlings. Here’s the corner we planted in the Kids’ Snack Garden. 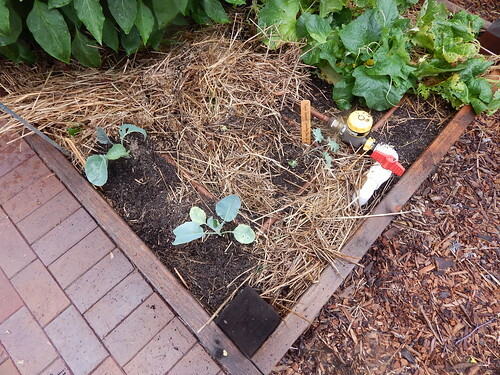 We planted a white cauliflower, a purple cauliflower, and a purple sprouting broccoli. Yes, I did have to pull out a couple of the cantaloupe plants to make a little more space. Yes, there were cantaloupes on them. Oops. ‘Santee’ Purple Sprouting Broccoli – This is a type of broccoli that puts out lots of smaller side shoots rather than a big head. The broccoli also has a darker purple tinge to it. ‘Apollo’ Sprouting Broccoli – Same as the ‘Santee’ but green. The sprouting broccoli is supposed to mature and produce sooner than the regular heads. ‘Arcadia’ Broccoli – Mid-season variety that is supposed to have good cold tolerance and produce nice side shoots as well as the main head. ‘Imperial’ Broccoli – This variety is more heat tolerant and grows slowly in cold weather. It will be interesting to compare the two varieties! ‘Purple Peacock’ Sprouting Broccoli (Kids’ Garden) – This is a broccoli-kale cross that already has neat leaves. You can eat the leaves or the loose heads. ‘Veronica’ – This is a green, romanesco type cauliflower. The head is bright green, and instead of having the rounded heads it has very angular curds. ‘Amazing’ – This is your classic white cauliflower that has self-blanching wrapper leaves. (Often you have to tie up the leaves to get a nice white head.) It is supposed to have both heat and cold tolerance. ‘Cheddar’ – This is an orange cauliflower. We’ve grown it before, but in the spring. ‘Purple of Sicily’ – This is an heirloom variety that has purple heads. Because it is an heirloom, I’m expecting the heads to be more mottled purple and white rather than solidly purple. ‘Denali’ (Kids’ Garden) – Another white variety that has good heat and humidity tolerance. We’ll give the humidity part a test, that’s for sure! ‘Graffiti’ (Kids’ Garden) – This is a hybrid purple variety that is much more uniformly purple. ‘Ruby Perfection’ – A red, smooth leaf cabbage. It has round heads and is typically 4-6 pounds. ‘Tendersweet’ – A green cabbage that has flattened heads. It typically has thinner leaves and a very sweet flavor. ‘Deadon’ – This is a red-green savoy cabbage that gets more red with the cold and has very good cold tolerance. The recommendation is to harvest them in early winter after several frosts or freezes! When we selected varieties, we tried to get a range of different varieties, while looking for those with characteristics that would help them be successful here in the fall. The challenge was if we should choose cold tolerance for the later part of the season or heat tolerance for the first part of the season! Thinking about all these beautiful cabbages has me almost ready for fall! 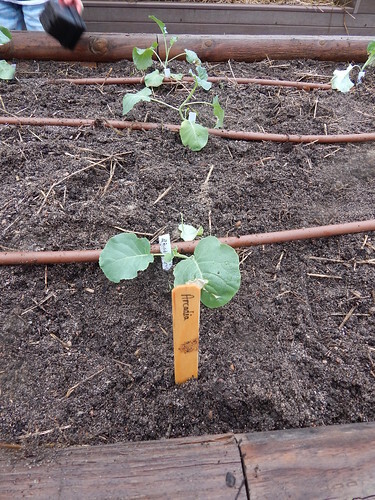 Posted on August 13, 2013, in Working in the Garden and tagged broccoli, cabbage, caterpillars, cauliflower, fall garden, planting, transplants. Bookmark the permalink. Leave a comment.